Bathukamma is one of the state festivals of Telangana. The festival is celebrated during Dussehra. The entire state is decorated with beautiful and colorful bathukammas. The festival starts from Mahalaya Amavasya day and ends on Durgaashtami day. In many school across the state, school children take active part in the festival and make Bathukammas as a part of their school activity. 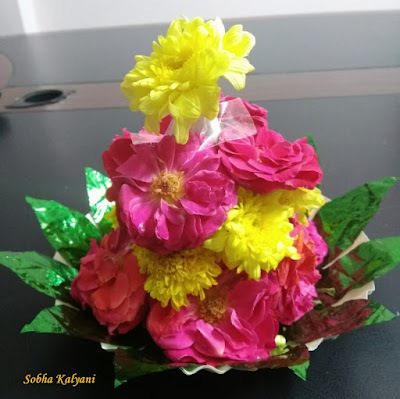 Here is a simple and easy way of doing Bathukamma for children's activity. Take a birthday cap, if you have one or make a cone of desired size with a chart part. Stick it on a paper plate with fevicol / glue / cello tape as per convenience. Take fresh flowers of different colors. Stick the flowers of a color of your choice at the base of the cone in a circular pattern. You can use either glue / cello tape / stitch it with a thread and needle. After completing one circle round the base, stick flowers of a different (contrast color) color above the 1st circle of flowers. Continue this with circles of alternate color flowers till the tip of the cone. At the tip, make a small hole with a needle / pin and place a brightly colored flower. Decorate the base i.e the paper plate with fresh green leaves or paper-made leaves, in a circular pattern.